Luis Freitas has been pleased that Billingshurst have exceeded last season’s points tally in his first season at the helm, but stressed there is still room for improvement. ‘Hurst sit 11th in Division 1, having picked up 27 points from 21 games, and are 16 points away from the relegation zone. 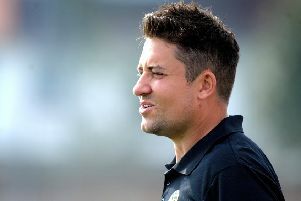 Freitas had targeted a top-half finish in his first season in charge, after the Jubilee Fields-outfit finished two points above the drop last year, and his side are close to achieving this goal with just over half the season gone. He said: “This season so far has been wonderful with loads of ups and downs. My plan was to get more points than the whole of last season and we’ve already done that. “I said at the start that we wouldn’t be fighting for our life at the bottom and we are not, but I’m not happy as we should have had more wins. Freitas was also proud that his squad has taken wins against teams with greater financial muscle than them. However, he has been less impressed with displays against sides below them in the table, ruing ‘players taking their foot off the gas’. Freitas added: “My highlight has to be beating teams above us with more of a playing budget than us. “The low point has to be that we haven’t won as many games as we should have, and no disrespect to teams we have beaten this season, but there has not been a game where we were lucky to win. ‘Hurst return to action on Saturday at Wick.